EDCO Products, a Minnesota-based manufacturer of residential and commercial exterior building products, announces the promotion of key leaders to executive roles. For more information, visit www.edcoproducts.com. EDCO Products, a Minnesota-based industry leading manufacturer of residential and commercial exterior building products, was named the 2018 Minnesota Manufacturer of the Year in the small-company category by the Manufacturers Alliance. The award recognizes EDCO’s outstanding manufacturing capabilities, as well as, their commitment to sharing expertise within the manufacturing industry through training events and monthly peer meetings with the Manufacturers Alliance, Enterprise Minnesota, and Association for Manufacturing Excellence. Founded in 1946 by Arthur Edwards Sr. and his two sons, Arthur Jr. and John, EDCO has endeavored to design, manufacture and distribute innovative, durable, affordable residential exterior building products. Today, the company, which is now into third and fourth-generation family ownership, is one of the oldest and largest manufacturers of pre-finished metal products in the United States. With manufacturing excellence as a founding principle at EDCO, the company has established a reputation as an industry leader with its innovative and award-winning line of siding, roofing, soffit and rainware products, as well as, a complete line of color-coordinated accessories. The award was presented to EDCO during a ceremony held on April 12th at the Golden Valley Country Club. The event was followed by an invitation-only “Tour of Excellence” for Manufacturer Alliance members at EDCO’s manufacturing facility in Hopkins, MN. EDCO Products announced a partnership with ICA Food Shelf to commemorate EDCO’s 70th anniversary. Pictured are Chris Doucet, EDCO’s director of sales, and Peg Keenan of ICA Food Shelf. 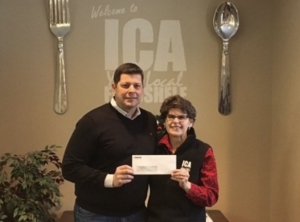 In conjunction with the company’s 70th anniversary, EDCO Products Inc. announced a long-term partnership with ICA Food Shelf that will provide financial support, as well as additional employee involvement with future ICA initiatives. EDCO Products, a manufacturer of residential and commercial exterior building products, is located in Hopkins, Minn. The company’s current commitment with Minnetonka, Minn.-based ICA Food Shelf runs through 2020, with the potential to expand and/or extend the partnership into the future. According to the company, EDCO officially incorporated in 1946 and began a 70-year journey with a laser-focused commitment to innovation, quality and service. The entrepreneurial spirit of Arthur Edwards Sr. and his son, Arthur Edwards Jr., led to the creation of an award-winning residential and commercial building products manufacturer which established its headquarters in Hopkins, where the company’s main offices and manufacturing still exist today. Arthur Edwards, Jr. continued to work at EDCO each day until his passing in 2012 at the age of 92. His inspirational legacy lives on today through his two daughters, Jan Edwards and Danae Kasbi, as well as his grandson Kavon Kasbi, who are now the third- and fourth-generation owners of the company, respectively. EDCO Products introduces five additional colors to its Infiniti Roofing line, metal roofing that features multi-tone layering, permanent thermal-fused texture and Whisper Quiet technology. EDCO Products has introduced five additional colors to its Infiniti Roofing line, metal roofing that features multi-tone layering, permanent thermal-fused texture and Whisper Quiet technology. The new solid colors include Granite Gray and Chestnut Brown. The new enhanced colors are Aged Bronze Enhanced, Granite Gray Enhanced and Chestnut Brown Enhanced. The colors are supported with a full line of color-coordinated accessories.